Thread: I maybe got a picture of a UFO. What do you think? Hey, everyone. I hope you're all doing well. Anyways, I figured I'd post here too! It certainly can't hurt, besides, I like this place. You guys seem to have your wits about you and the atmosphere is relaxed. But basically, I was in Nevada, in an airplane, and saw something weird in the sky. I tried my best to take a picture from my cell phone with the 10 or so seconds I had, and here's the result. Personally, I still don't know if what I saw was just some boring blimp, or something more remarkable. If I'd had to take a firm stance, I'd put my money on it being some kind of military craft, given the location of where I took this photo. Nellis Air Force Base is like a spit away, and Area 51 isn't too terribly far, either. It could literally be anything, hard to tell from this distance. Since Nevada is where they test most of the experimental aircraft / spacecraft for the USAF, including the ones commonly believed to be UFOs, that is the most likely explanation. Let me see if I can pull some of my magic and embed the pictures here for you. Well, a blimp or a drone would be plausible explanations, but judging by both the silhouettes — the object seems to have turned to its right (or the viewer's left) between the first three pictures and the last two — my money would be on it being a Boeing CH-47 Chinook helicopter. P.S. : You've posted this in the Personal Experiences forum, which is members-only. Was that intentional, or would you rather I move this to (the publicly visible) Ufology & Extraterrestrial Intelligence? Not at that altitude, no. Firstly, excellent pic wizardry there Aragorn. I don't see any indication of the twin blades, so I'm not so sure about the Chinook hypothesis. Then again, I'm not entirely sure the blades would be visible from those angles, having quite a thin width and rotating so rapidly. Everything about the pics suggest blimp to me. Judging by the surroundings, it's relative size would seem to negate any traditional aircraft that I'm aware of. Regardless, it's refreshing to see an actual picure(s) to go along with a story like this. In this community, I'm not so much starved for evidence as I am effort. There are countless anecdotal bits that, if true, usually reveal an easy opportunity to get a picture. Generally, there are endless excuses as to why this never happens. It's frustrating. Thanks for sharing this Indigris. Hmm...didn't know there were dual-bladed choppers like that, Aragorn. However, the thing seemed to move laterally, once it had turned, so who knows. Then again, that could just be an illusion due to its altitude and position. Thanks for the pics, though! I have some zoomed-in pictures which to me, made me question what I captured. I'll attach a couple of the better ones in this post, so people can see what I'm talking about. To me, that second picture looks quite saucer-shaped, but again, it's just blurry enough for me to still be on the fence. On one hand, it could simply be a blimp/chopper, but it could also be some kind of spacecraft, given its size and shape (at face-value). If you look at the second image, you can see the conventional raised top that you see in saucer type craft, but that could easily be where the blades would attach on a chopper. But even then, the craft I saw, as brief as it was, was BIG. I was in a full-sized airplane, and there were more of them landing at that moment, and the craft I saw dwarfed those, even when at the same altitude. That being said, I'm not discounting the possibility that, again, it seemed closer/bigger than it actually was, as is often the case with things in the sky, or that choppers of that size exist. I don't know much of anything about military craft; not really my area. Someone else will have to chime in on that point. So, then, a blimp. The thing about blimps, and I've seen a few of them in my life, is you can generally see the seams of the balloon, as well as the hanging cabin thing. I saw neither, and it seemed to be reflective, as if it were made of metal. Furthermore, most blimps have ads on them, or at least some kind of logo; this had none. But, but, but, I did only see it for a few seconds, and my photos are blurry, and memory is fallible, so who knows. Maybe those other pics in this post help push anyone in either direction? As far as I'm concerned, I still don't know what it is. If it IS a UFO, though, it's almost certainly military, rather than ET, imo. You're very welcome. My pleasure. Y'know, I had always been frustrated by the same thing. I figured, in 2018, there is 0 reason why people aren't getting more photos of UFOs. But then, I saw my first one, about 8 months ago. It was your standard triangular craft (probably military). I never got a chance to snap a pic of that one. First off, I was initially so flabbergasted, that the thought to document didn't hit me until about 20 seconds, at which point my bf and I had to pursue it in our car to get a better look. Then, when I did finally get my phone, the battery was at 3%, so it wouldn't let me snap pics. And my boyfriend's phone is a piece of crap, so his camera was useless. We did try; the photos that came out had 0 value whatsoever. Then, you hear stories all the time of people having electronic malfunctions when attempting to photograph this stuff (or the photos mysteriously disappear). So there's that. Finally, tack on the fact that most people look down more than up nowadays, and that explains the distinct lack of super-duper-good photographic evidence. In any case, I keep my phone charged now, lol. Oooh, sure! The more, the merrier, right? I need to start paying more attention to which threads are viewable by the public, and which aren't. Hmm...didn't know there were dual-bladed choppers like that, Aragorn. Well, all helicopters are dual-rotor, but usually the tail rotor is placed vertically, and on some helicopters, the main motor has two counter-rotating rotors. But the Chinook and others like it have two separate "main" rotors instead. The reason why there are always two rotors is simply a matter of physics. For every force, there is an equal and opposite force. So with only one rotor working, the torque on the rotor shaft would cause the entire helicopter to start spinning like crazy in the opposite direction of the rotation of the propeller as soon as it clears the ground. The second rotor is there to prevent that from happening. On most helicopters, this second rotor is vertically placed in the tail section and directed to one side. The pilot then controls the speed of that rotor with the two rudder pedals — which are physically linked to one another so that when one pedal is depressed, the other one rises — in order to harmonize it with the speed of the main rotor, thereby keeping the helicopter from spinning. By varying the speed of the tail rotor by way of the two pedals, the pilot can thus horizontally steer the helicopter. When taking off from a landed position, the pilot must slowly let the left pedal rise just like the clutch pedal in an automobile with a manual transmission in order to synchronize the torque-countering effect of the tail rotor with the increasing engine speed of the main rotor. 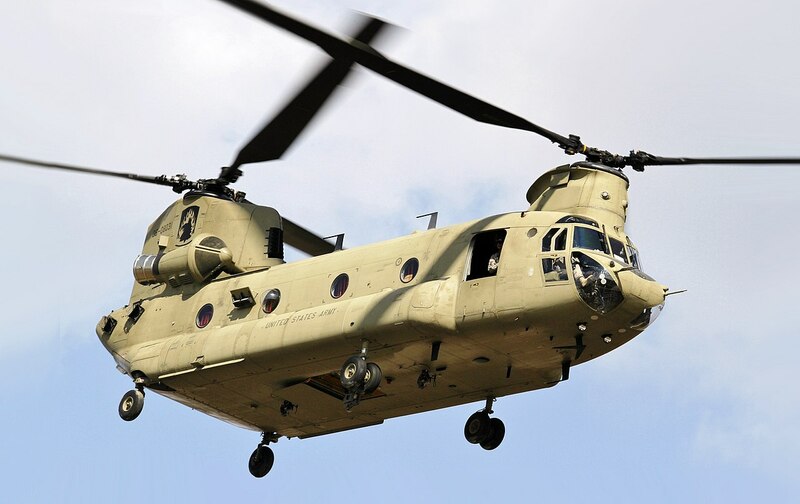 The reason why the Chinook has two main rotors is because it needs the extra thrust and lift. It's a heavyweight lawnmower. However, the thing seemed to move laterally, once it had turned, so who knows. Then again, that could just be an illusion due to its altitude and position. Well, that would once again be consistent with a helicopter. Helicopters can indeed coast sideways. Contrary to what is commonly believed, the two jet engines you commonly see on a helicopter are not there for direct jet propulsion. Instead, they are used as gas turbines, whereby the turbines connect to the rotors by way of a set of gears. The actual forward, reverse or sideways motion of the helicopter comes from tilting the main rotor forward, backward or to the sides, which the pilot does by way of a flight control stick, commonly located between their knees and similar to that in a jet fighter. A second lever to his/her side contains the engine speed and elevation controls — engine speed by way of a twist grip (like on a motorcycle), and elevation by pulling the lever up or pushing it down, which changes the collective pitch of the rotor blades. The thing is that when you enlarge something like this, you get a lot of pixellation, resulting in blocky artifacts. As such, something that isn't a straight line suddenly looks straight, or a bulge that isn't there suddenly starts looking as if it is, simply because something from the background was mapped in with the color of the foreground by the pixellation. It's really hard to tell. The distance and the perspective may have been deceptive, yes. But on account of sizes, no, helicopters as big as a passenger plane do not exist. Blimps on the other hand, yes, they can get quite large. Another misconception to clear up here: blimps aren't necessarily made like a balloon. The more generic term for airships is "lighter-than-air vehicle". Some of them are actually made of solid (but fairly lightweight) materials, such as aluminium, carbon fiber and/or fiberglass. After all, the craft gets its buoyancy from being filled with helium. And on these newer airships, the cabin also doesn't look anything like the old ones anymore. They are still located underneath the main fuselage, but they are now much more streamlined and vertically slimmer. Well, the military generally prefer to avoid flying secret prototypes over populated areas during broad daylight. That would immediately destroy any and all plausible deniability. And if this were some kind of antigravity craft, then they'd probably be even more concerned. I'm not saying that it was a helicopter, or that perhaps it was a blimp. But all things considered, those two hypotheses do seem to be the most plausible conclusions. Yeah, given all of this info, Aragorn, my money at this point is on a blimp. It makes the most sense. There is huge value in posting these experiences because it gives others a chance to "cross reference" information from their own experiences. So Thank You for posting this! While there Nv may have plenty of planes, "blimps" and drones to fill the sky, I lean heavily toward your experience as being a legit UFO from personal experience of capturing objects like this on film. Although I really don't know what these objects are, or why they manifest the way they do, but I call them "dark orb" UFOs. They are not balloons, "drones"...I think these were actually seen at Gatwick, birds or gigantic insects. They look like energy masses of some kind that can manifest with bright colours against a blue sky, or as a greyish mass against an overcast sky. When examined on film, especially close up while slowing the frame rate, you can literally see a change of field...and a torsion field that morphs as the object moves along or hovers. The torsion field manifests as a kind of spinning energy, and you can often see holes or ports appear in the field. And yes, these objects change shape....and can do so drastically. Below is a shape changing "dark orb" object I captured in Jan of 2018. For some very odd reason, I've captured these a few times, was baffled by the experience, and decided to share it. It has more video and photo example of what I think you have captured. Its kind of long, but as you get to the end there are various other examples of captures from others that are similar. The "stills" you posted at PA...especially the closeups....that looks exactly like what I've filmed. So, in my opinion...from my experiences with these...you caught a real UFO.